Mike Hicks had just driven 1,700 miles cross country, including several hours through the West Texas badlands, a bleak, unforgiving stretch of highway that's somewhere between nowhere and forever. 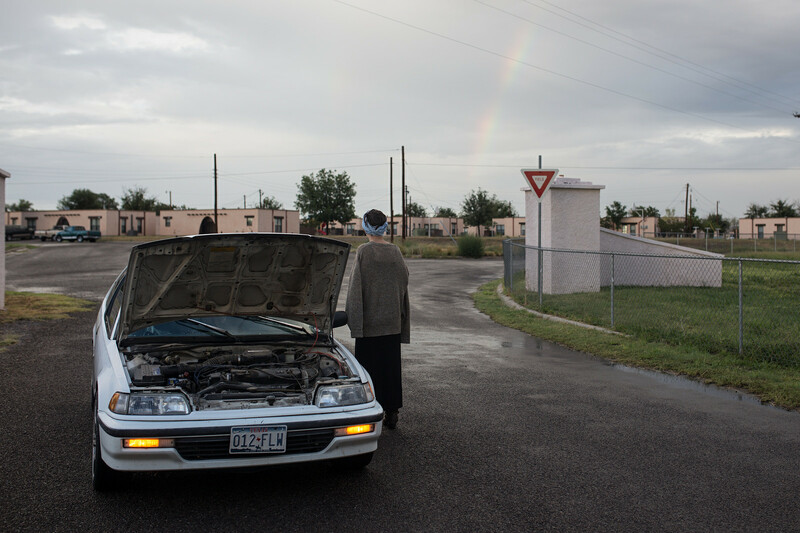 Arriving in Marfa, Texas to visit a friend, he was feeling broken down. The drive on I-10 hadn't helped his mood. "I remember this feeling of being completely overwhelmed by sky," says Hicks, who grew up on the East Coast and was living in San Francisco at the time. "I felt almost oppressed -- kind of terrified by it." One of the first pictures he took in Marfa was a photo of his friend standing next to her broken down car. It wasn't until later, after he processed the shot, that he realized the impact the rainbow had on the image. That shot is included in an exhibit entitled "Faith" that opens August 9 and runs through October at the Leica Store gallery in Washington, D.C. The exhibit features the work of the Strata Collective, a group of photographers who are best known for their sharp-edged street photography. While religion is the first thing that comes to mind when you think of "faith," it's by no means the force that drives this exhibit. The 24 images in this eclectic collection, when taken individually, are thought-provoking. Grouped together as a statement on faith -- whatever that may be -- they are powerful. "We specifically wanted to make the idea of faith a little more elastic," Hicks says. Hicks is one of the founding members of Strata, which came together in 2012 when a group of Washington, DC-based street photographers decided to pool their collective talents as a way to provide each other creative support and increase their impact. The other members of the collective are Bill Bramble, Matt Dunn, Steve Goldenberg, Hector Isaac, Chris Suspect, Aziz Yazdani, and Joshua Yospyn. Of his fellow members, Hicks says they are "some of the most talented and accomplished photographers I've ever met, and I'm lucky to be in a group with them." Indeed, their work -- individually and as part of the collective -- is well known in street photography circles, far beyond Washington, D.C.
Eric Oberg, who runs the gallery at DC's Leica Store, says he approached Strata last year about doing a show. He presented the group with a couple potential themes and the members decided on faith. As both photographers and engaged citizens, the members of Strata Collective explore the notions of faith and the things people hold onto in times of uncertainty, whether it be God, country, communities, resources, family, or ideas . . . It's on the street that faith is proclaimed, tested, reinforced and abandoned, against the backdrop of a rapidly changing American landscape. In the photograph sent out with the release, a group of clergy are taking shelter under a tree during a downpour. "Where is the faith being placed?" Oberg says of the photo by Chris Suspect. "The faith is being placed in the tree." Visitors shouldn't come with preconceived notions about what they're going to see, Oberg says. Like a lot of good street photography, the photos make good use of humor and irony. And while some are literal interpretations of faith, others require the viewer to try and get inside the mind of the photographer. "There are a couple images in here that I still have questions about," he says. When it comes down to it, being a street photographer requires quite a bit of faith. Trying to find images that rise above the run of the mill -- those pictures that, as Strata puts it, "are hard to make and even harder to categorize" -- can be a daunting task. "It's not easy going out there every day and sometimes being really discouraged -- and sometimes the gods just smile upon you," Hicks says, commenting on street photography, though realizing later it could just as easily have been a description of faith. "You don't know what you're going to get when you're walking out the door, but you have this feeling that something is out there and you're going to find it." Image of woman with car © Mike Hicks. 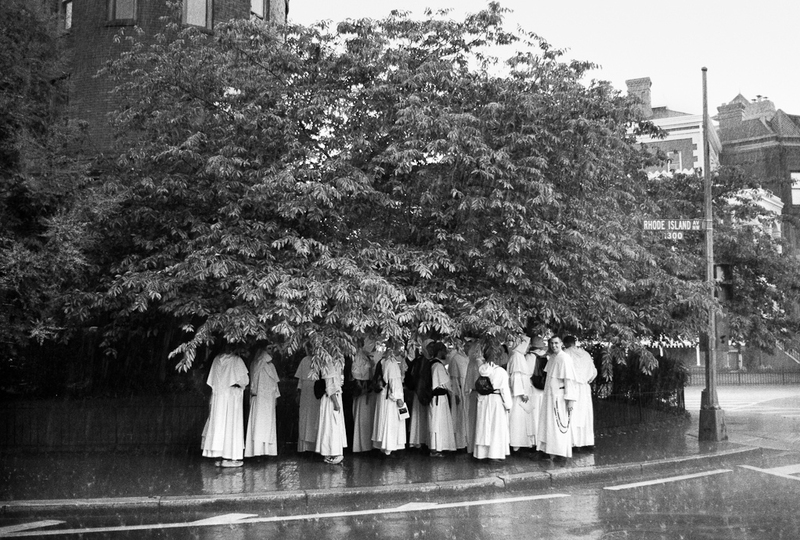 Image of clergy under a tree © Chris Suspect. They are used here with permission. To learn more about the Strata Collective, visit their website. To learn more about the "Faith" exhibit, visit the Leica Store DC.